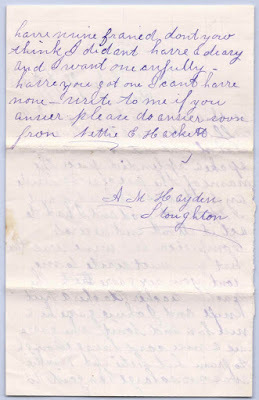 Letter dated 3 January 1873, sent by Nettie E. Hackett, at Wareham, Massachusetts, to Mrs. Addie M. Hayward at Quincy, Massachusetts. 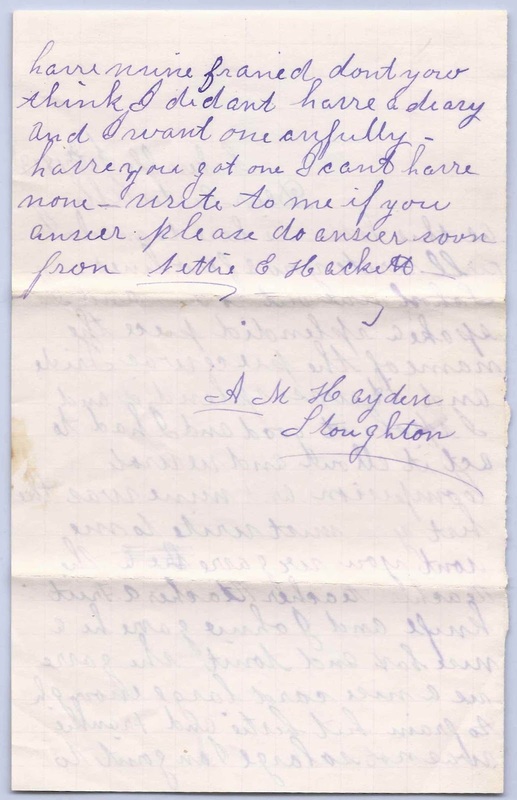 This letter may have a relationship to a letter that was the subject of an earlier post, an 1866 letter from Mary Maynard at Janesville (Iowa, I think) to John Townsend at Lakeville, Massachusetts. From scratching the surface, I've found that Nettie was Eldora Purdenet Hackett, a half sister to Abbie Maria (Hackett) Hayden. The envelope above contains a smaller one, below, which contains the letter shown farther below. Whatever letter there might have been in the larger envelope, which was likely from Abbie's parents, is sadly missing. 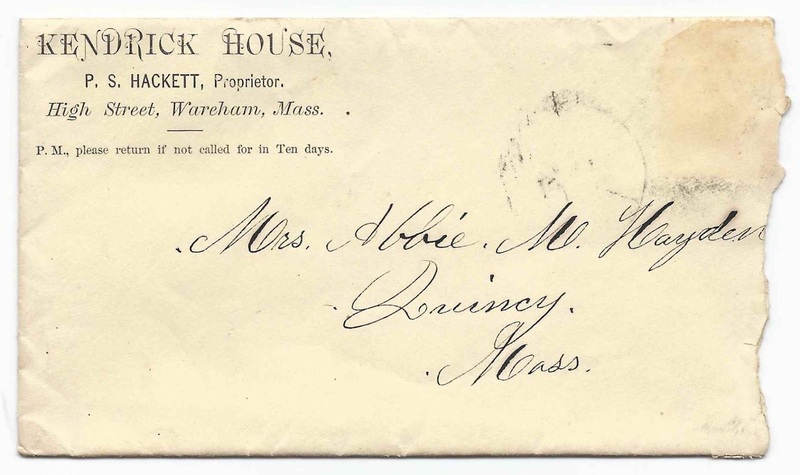 Abbie Maria Hackett was born 28 November 1848 at Middleborough, Massachusetts, the last child of Peleg Sumner Hackett and his first wife Lydia (Waterman) Hackett. She married Charles Monroe Hayden at Quincy, Massachusetts, on 30 November 1871. Charles, born about 1848, was the son of James Monroe Hayden and Adeline (Wild) Hayden. Abbie died in 1940 in Barnstable County, Massachusetts. 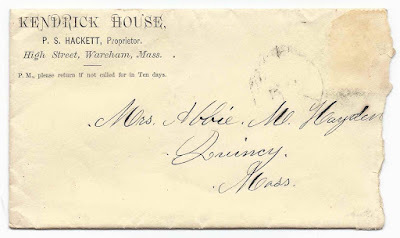 As stated above, I believe that Nettie E. Hackett was Eldora Purdenet Hackett, born on 6 August 1861, at Lakeville, Massachusetts, the first child of Peleg Sumner Hackett and his second wife, Betsy Clark (Coombs) Hackett. "Nettie" married Edward Hathaway about 1888. By the time of the 1900 Census, she was already widowed and living with her parents. Like her husband, she also died young, in 1907. Nettie may have been the older sister of a young woman whose graduation photograph is featured in another post, that of Arleen Hackett, from Middleborough High School, possibly Bessie Arleen Hackett. As this letter is here to mail, I will write you a few lines. School was out to day and I spoke a splendid piece. The name of the piece was "Pride", and it was splendid and I spoke it good and I had to act it all out and we wrote ? [compersion - composition?] and mine was the best. You must write to me, won't you. We gave the teacher a fruit knife and Johnnie gave her a nice box and tonite she gave me a nice card, large enough to frame, but Bertie and Frankie was not so large. I'm going to have mine framed. Don't you think I didn't have a diary and I want one awfully. Have you got one. I can't have none. Write to me if you answer. Please do answer soon.